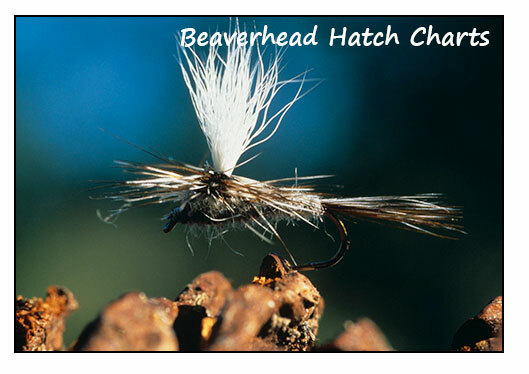 The upper portion of the Beaverhead, stretching about 12 miles fromthe Clark Canyon Reservoir to Barretts Diversion Dam, is the most fished section. Many anglers believe this section is one of the top three or four waters to fish in the lower US. The outflow from the reservoir pumps cold water into the Beaverhead river, making it the coldest section of the river and provides.excellent habitat for large rainbows and brown trout. Montana Fish, Wildlife and Parks biologist routinely shocked the river to determine the health, size and numbers of fish in the river. According to them, there are approximately 1500 fish over 23 inches per mile. This does not include the little ones under 23 inches. The total number of fish per mile is approximately 3,800. This means an angler is casting to a fish of four pounds or better every 20 feet of bank. Overhanging willows and cottonwoods line the banks of this fast-flowing stretch. Wading can be very difficult because of the brushy banks and steep cliffs. Yet, while casting to the banks can be tricky, floating the Beaverhead river is by far the easiest and most productive way to fish this section. The Brown Trout in this section have been aptly named the "freshwater Tarpon" because they are not only large, but have a very nasty disposition and dislike people!! Over the many years our guests have fished the upper Beaverhead, we feel for every 10 fish you hook you might land four to five. This is because a number of fish will straighten or break the hook, break the 4 or 5 pounds test tippet and wrap your line around anything they can find. Many anglers remember the all out fight with the fish they lost, even more so than the ones that they landed. Below Barretts Dam, the Beaverhead River flows into the valley where irrigation plays a major role. While the dam diverts nearly half of the river water, private lands use much of the remaining flow for irrigation. Therefore, the Beaverhead River from Barretts Dam to Dillon is slower than the upper section making it classic brown trout water with deep undercut banks, overhanging bushes and submerged roots which gives the Brown Trout excellent cover and habitat. While wade fishing is much easier here, accessing the river can be difficult because it flows primarily through private lands. The stretch of water from Dillon downstream to the confluence with the Ruby river holds substantially larger fish. For anglers looking for a more secluded walk-wade or float, our guides at Five Rivers Lodge have the knowledge and access to many of the best fishing areas on the lower Beaverhead river where access is almost nonexistent because of private farmland.